Overbite correction is one of the most common reasons patients come to our Orthodontic team – or in plain English – to reduce the amount their front teeth stick out! There are many reasons to do this. Luckily here at Winning Smiles we have plenty of ways of treating big overbites (and reversed overbites….but maybe that’s one for another day!). As with everything we do, it’s all pretty logical; if you want to reduce an overbite we can either move the top teeth backwards, or move the bottom teeth forwards, or, as in most cases, a bit of both. To move the top teeth backwards we normally use a combination of expanding the top jaw width ways, whilst using elastic to pull the top teeth backwards. This tends to give great, broad, aesthetic smiles whilst treating the overbite. Some dentists will frequently ask you to have 2 top teeth taken out to reduce a big overbite, so as they can pull all of the front teeth backwards; We’re pleased to say that this is something we very rarely do at Winning Smiles. We try to keep healthy teeth wherever we can, and 90% of our treatments are completed without extractions. 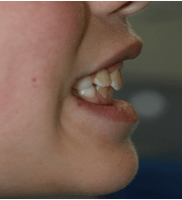 There are also techniques we use to try and help the lower jaw slide forwards, and in doing so move the front teeth forwards. We can do this with functional appliances in younger patients, a type of brace that uses your own growth to help correct an overbite. We can also use fixed braces with elastic to help move the lower teeth. Depending on the severity of the overbite, it can be corrected in as little as 6 months, with prices from £1,200. To find out if this treatment could be appropriate for you, why not contact us for a free consultation? If you are tempted, then fill in the form below, and we’ll contact you to arrange a convenient time. 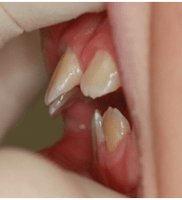 The following costs for Overbite Correction are correct when written, but they can change. We will provide written pricing for each ‘cosmetic treatment’ as part of our free consultation.You don’t have to be a member to have treatment at Winning Smiles.